It is typically a natural thing for most of us to be an encouragement to our friends - the people we already know and trust. 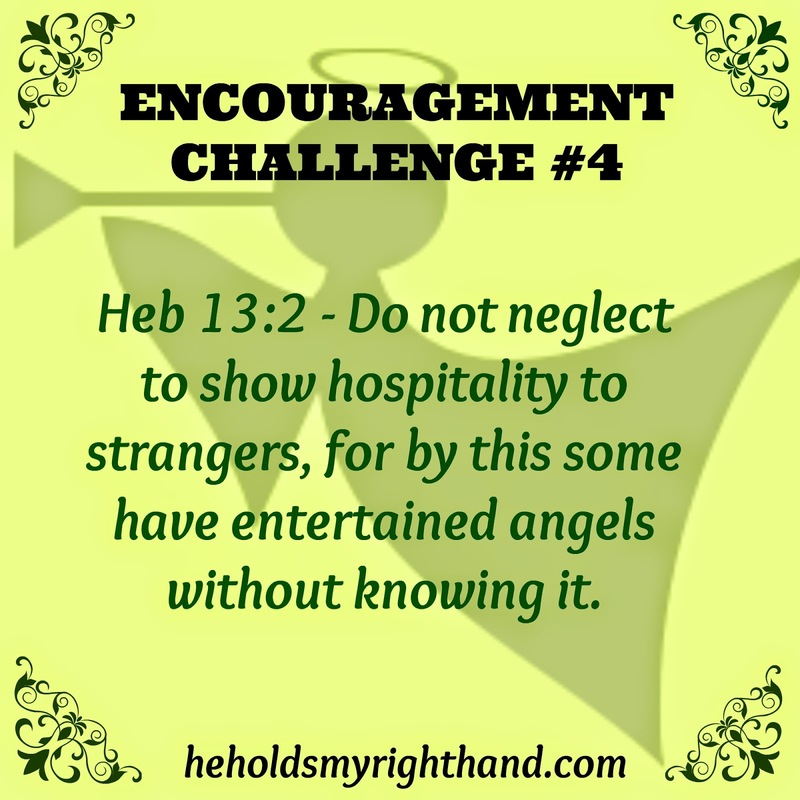 But, the Bible is clear that we should also be encouraging (showing hospitality to) strangers. What does it mean to show hospitality? It means to be generous and friendly towards someone, even if you don't know them very well. It's not just about entertaining or having people over for dinner (although that is a great thing to do!) It's about showing the love of Christ through ANY act of service. Do something kind for someone you don’t know that shows Christian hospitality toward them. Pay for a cup of coffee or a doughnut at the coffee shop, invite a visitor at your church over for lunch after services, get to know a co-worker or a neighbor by inviting them over for an evening, volunteer at a local food pantry or soup kitchen, provide a meal or a special treat for your local fire department, police department, or Ambulance service. The list goes on. Just keep your eyes open and take the opportunity to BE JESUS to a "stranger" this week. It's funny, but I shop at a grocery store where you have to pay a quarter to use a cart. Sometimes I forget to bring a quarter though. Several times now the cart I have picked already has a quarter in it! I was thinking that they might have been left there just to be kind and helpful to a stranger! This little act of kindness has inspired me to do the same thing! I think you are right, Sylvia! Some people do that just to be kind. I have had that happen to me as well, and have passed the cart along to someone else without taking a quarter for it. Even little acts of kindness like this can really help brighten someone's day. Thanks for visiting my blog Victoria...I love your name and your Bible Verse is one of my favorites. As I was looking over your blog, I see that you have had many trials and you have come through them with a sweet spirit. I admire you! We have a little 3 year old grandson, Baylor, who is autistic. He is in therapy and is making progress but it is heartbreaking to have a child that you do not seem to be able to reach. I bookmarked your blog and I will be visiting again. Thanks so much for stopping by, Arlene! I love your blog, too, and signed up to for updates today. If you or your son/daughter have questions about autism, or just want to chat, feel free to contact me!